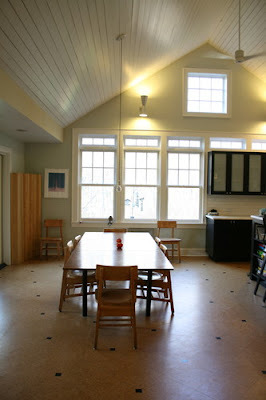 This house is from Andrea's location scout files, in Darien, CT. 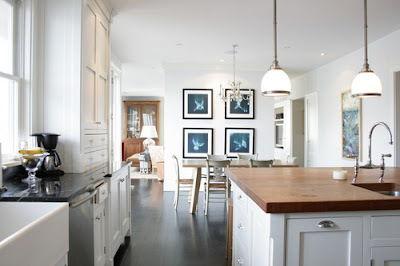 I think the combination of traditional cabinetry, floating walls and open floor plan is interesting in parts. 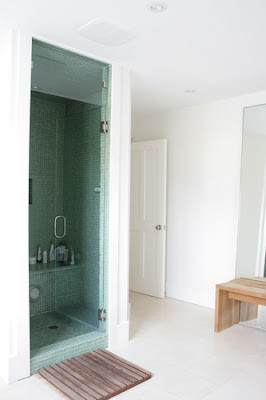 Interesting to think about as we consider how to return an extremely contemporary interior to its traditional roots. Radin chose the black Windsor chairs for contrast -- "like a punctuation mark" -- in the creamy room, painted White Dove by Benjamin Moore. 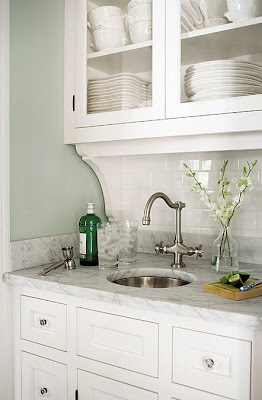 Tiles, sinks, and faucets are by Waterworks. Stone and wall oven, warming drawer, microwave, and hood are Viking. 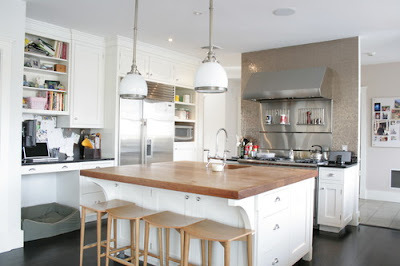 The hand-planed, slightly distressed floors are stained antique walnut. 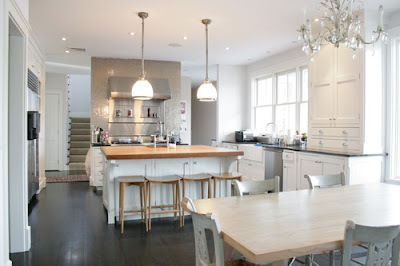 The family room is a natural extension of the kitchen. 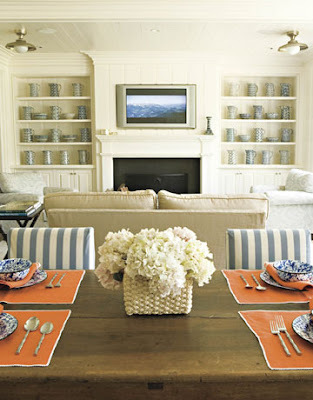 Striped fabric on the breakfast chairs is Buoy in bluebird by Delany & Long. 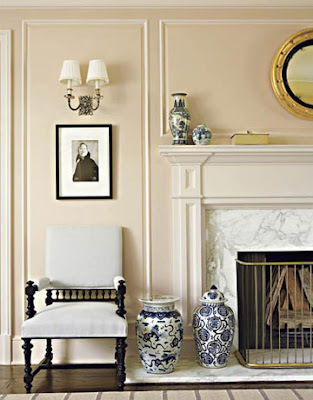 In the family room of this new L.A. house, Benjamin Moore's Dove White sets off the owners' collection of 19th-century American spongeware. 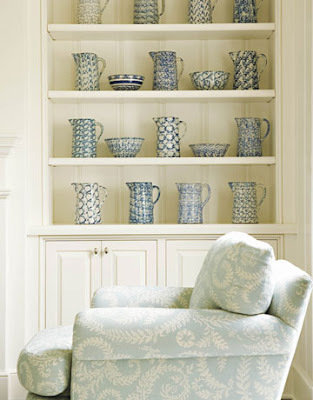 An easy chair, one of a pair, is covered in Morelia in Robins Egg from Raoul. 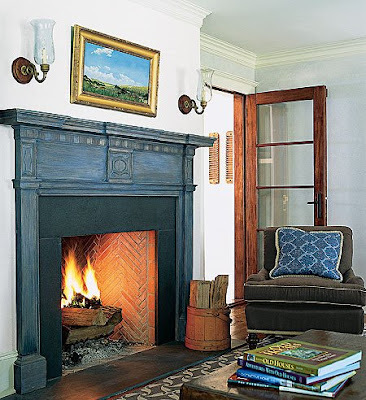 Most of the upholstered furniture in the house was designed by James Radin. Living room chair from Lee Stanton Antiques; Patterson, Flynn & Martin rug. 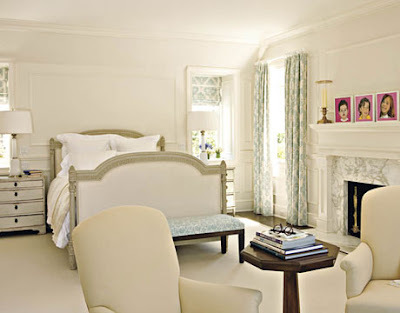 Warm light and an aura of tranquility define the mood in the master bedroom. 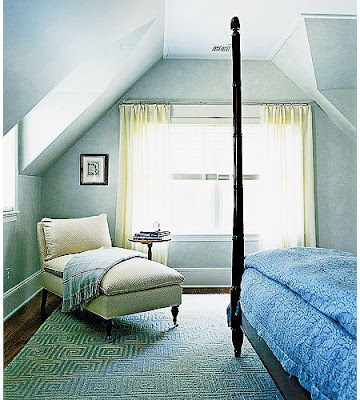 Curtains and roman shades are Cowtan & Tout's Sutton in aqua. A little stuffy for me... but still peaceful. 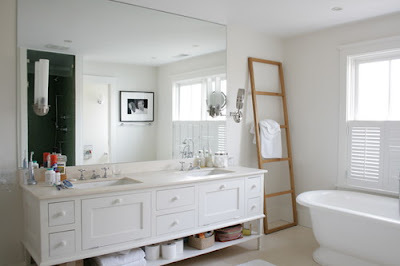 To read the whole article from House Beautiful, go here. I wish my laundry room were this clean, organized and fabulous. I don't think I am going to pony up for the LG steam washer/dryer combo, but I will go for LG which I have heard rave reviews about. 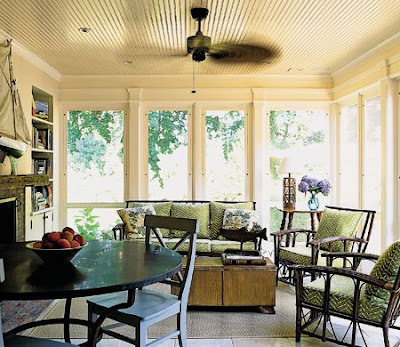 One of my favorite houses was featured in Martha Stewart in September 2003, the house of William Abranowicz (photographer often featured in MS Living) and Andrea Raisfeld. 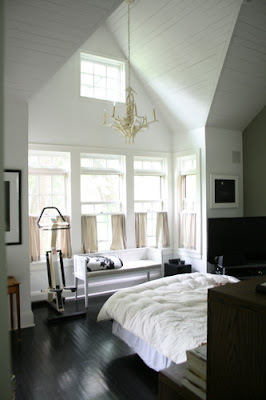 I love the stark contrast of black and white combined with the warm cork floors. 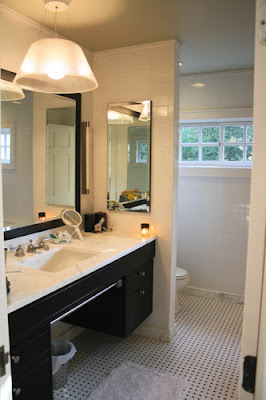 Kohler sink; Willard Brewer cabinets (Urbana, Illinois); Backsplash, Waterworks crackled field tile; Light fixtures, Moss, NYC. You can see more of their home (and Andrea's work) here. 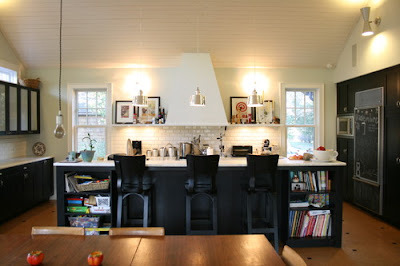 You can read about this kitchen redesign here. This is our house!!!!!!! We're so excited about it. 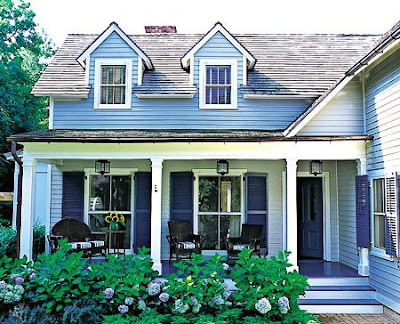 It's a 3 BR house in Concord, Massachusetts that was built in 1881. 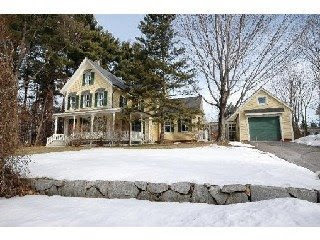 It's on Monument Street, across from the Minuteman park and backing on to conservation land. 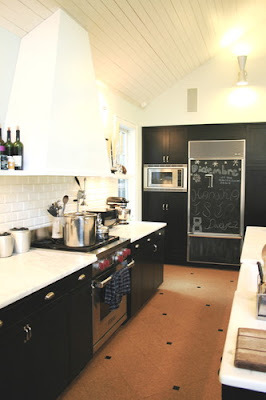 The kitchen tile is from Southampton Brick and tile 631-537-6353 - I think it is called the Grazia white crackle tile 3 x 5. 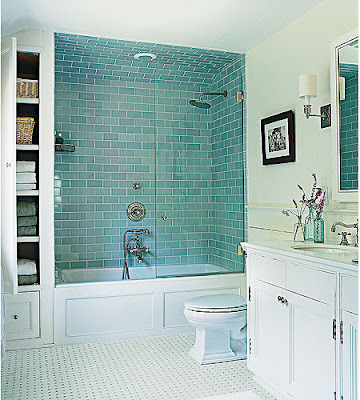 The master bath tiles are from Urban Archaeology V18B Bistro tile 3 x 6 light green 631-537-0124. 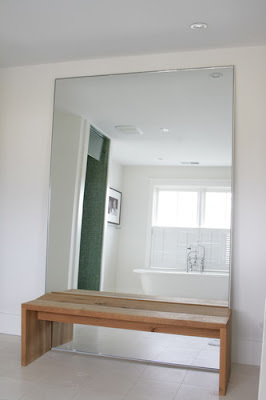 The vanity was made by the carpenters on-site. 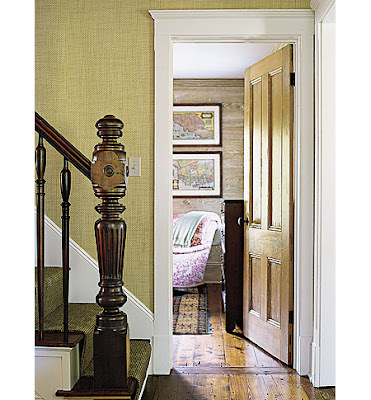 The stair runner is a custom runner from AM collections - I think they only sell to the trade. 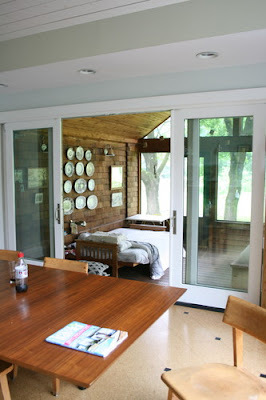 The floors and most of the paneling in the house came from the Antique Lumber Company in Water Mill NY. 631-726-7026 - speak to Holly or Don.